Susan Ershler and her husband Phil were the first couple in the world to climb the seven summits—the highest peak on each continent. Including completing the unbelievable journey in 2002, Susan’s climb count is 52 mountains in 13 countries with an average of 16,800 feet. Funny, considering she never had any desire to climb until the age of 36, when her then boyfriend (now husband) worked as a mountain guide and asked her to climb Mount Rainier with him. Phil was the first American to climb the north side of Everest in 1984, so for him, climbing had always been his life. Rainier was the beginning of Susan’s new life. To prove her own point, only 30 days after her first climb, Susan and Phil traveled to Africa to begin their seven-summit journey and climb Mount Kilimanjaro. Before then, Sue had never even been out of the country. “You can’t practice,” she laughs, talking about climbing more than 19,000 feet. “Sure, you can hike and train, but once it comes to climbing such heights, you just go. That confidence is an attribute Susan used in her professional life, which paralleled her climbing life, as she progressively worked her way up to vice president of strategic accounts in telecommunications. And it kept her going—for 10 years. 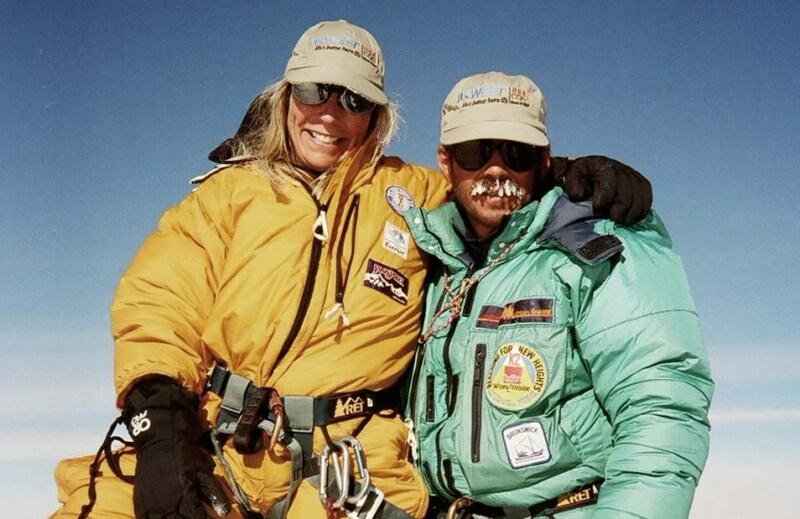 In 2001, she and Phil had made it to their final summit challenge: Mount Everest. She had read about the failed attempts—the deaths—and thought about everything she could lose. She had parents and three older brothers to consider, but not attempting Everest was never really an option. So Susan wrote a letter to her family—a goodbye—and sealed it away with instructions to open it if she failed to return. With Phil by her side, Susan took a leave of absence from work, signed a body disposal form, and the two began their journey up the Nepal side of Mount Everest. On day 63, Susan and Phil hit the route at 11 p.m. Climbing Everest at night gives climbers the most compact snow and ice, and if an accident happens, there will be a whole day of light to save somebody—or yourself. That morning, there was a death on another team, something that could instill fear in even the bravest climber, but they continued. The jet stream was harsh, as a single headlamp lit Susan’s way—her ice ax working as a cane. [The light] “puts you in this little world. You can’t see all the stuff you’re working over.” By the time they reached the balcony at 27,600 feet, Susan was feeling ill, and Phil’s eyes were purple; his eyes had started to freeze over. “Phil said to me, ‘we’re going to have to go down. Can you live with that?’ At the time, I wanted to go down!” Susan says. As they got lower, though, Susan felt defeated. “Maybe I got some oxygen in my head, but I realized, we didn’t make it, and we’re not going back. I had trained for years. I felt like my life was a mess—it was incomplete. I had seen myself up there, and then I wasn’t.” She had to go back and try again, but Phil didn’t want to. “He had been there, done that,” Susan says, and he didn’t want to lose his wife. But Susan already had her vision, and she wasn’t about to let it blur. So the pair went back the next year. With better weather, they made better time. “Your body can’t hold acclimatization, but it’s like muscle memory,” Susan says. “My body was clicking into the altitude much quicker than the last year,” which ironically, had served as her “practice,” something she didn’t think was possible. Susan won that competition after 54 days; she and Phil reached the top of Mount Everest. They spent 25 minutes basking in their achievement. “You’re on top of the world,” Susan says of what was going through her mind. After everything, it took only two days to get down, and when they did, they had their first interview with CNN, via a satellite phone from Everest base camp. Susan and Phil Ershler had made history. They were in high demand immediately after, and made the rounds on shows such as “Good Morning America” and “The Today Show.” But when asked, “What’s next,” by the journalists, Susan didn’t know the answer. “When I got home, I thought my life was going to be perfect. It wasn’t,” she says. So, because she had focused on her dreams for 50 years, she decided to focus on helping others reach theirs for the second half of her life. Susan is now a popular opening and closing speaker for conventions all over the world because she draws parallels between her physical climbs and her professional ones. She also spends time working with the American Himalayan Foundation to help stop trafficking of Nepalese girls and help them receive education. She still climbs, though, as she and Phil have vowed to make one major climb every year together. Their 2013 climb is this month, and they’re headed to Sikkim in the Himalayas of India, where they were engaged nearly 20 years ago.